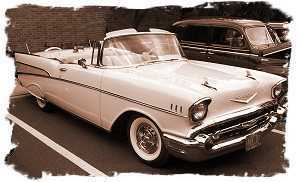 This was the week in August, exactly a half century ago that my 17 year old self took delivery of a new 1957 Chevrolet convertible. It strains my credulity to think that since I proudly drove that car from the dealer's lot, 50 years have come, been lived through and used up one by one, then slipped away into the past. The world I saw through the windshield of that car bears little resemblance to the one I now find myself in. The theater and the set is different, and so too is the cast of players. It's a sad fact that most of the people that were living when that car was new and I had 17 summers are not alive now. I ruefully think that perhaps the world seems so different to me because there are different people in it. Strangely I seem to feel about the same, for the most part. Unlike the car, which became a classic and is now worth 300 times or so what I paid for it, I am just an older version of the same person. My interests and passions still run along the same lines, but the hills and valleys that would trace their waxing and waning have leveled somewhat. One change I do notice is the importance that I attach to the car I drive. One day recently I counted up the age of the red Volvo I now drive and found it to be 21 years old. I thought about the 17 year old me, and wondered how I would have accepted driving through the summer of 1957 in a 1936 automobile. I think I would have hated it and that makes me smile. Maybe, just maybe, I did learn something from all those years.